This one is my favorite too, which I made for my nephew in the beginner of the year for his birthday. Thank you Mdm Samm for arranging just wonderful blog-hop and Amy @SewIncrediblyCrazy for being our cheerleader. Very nice quilts. I love the stroller makeover. How creative of you. Good idea to reuse the stroller and make a new cover using 'Spot' fabric. Lovely quilts! 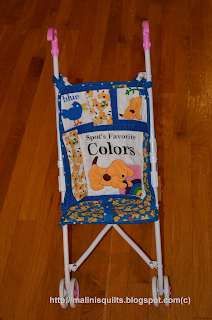 Clever idea to recover the stroller, and your quilts are beautiful! What a great makeover! Yes, a boy will take to anything with wheels on it. Great job! Your son must be very happy with his Spot stroller! The quilt for your hubby is unique and I love the baby quilt.. The quilting on it is fantastic! What a great idea to recover a stroller!! Looks perfect! Nice job on the stroller! I'm sure his little puppy enjoys his 'new' ride. I love the Modern Pods quilt! You had a great idea to re-cover the stroller. Love the quilts..all of them are super ! Thanks for sharing your projects. Love the quilting on the Cars quilt. I have a grandson who would love this quilt. The Cars quilt is outstanding and awesome. 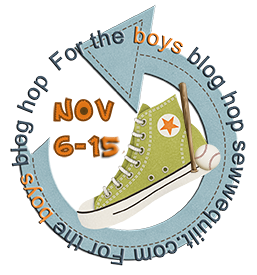 Thanks for sharing your creativity and being part of this hop. 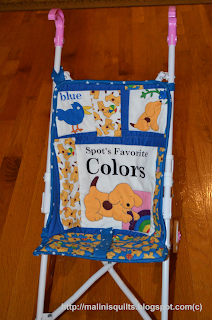 Love the stroller make-over...SPOT was the perfect choice. And well, that CARS quilt...who could resist that for little boys! Great finishes!! Congrats! All of your projects are wonderful. I am especially impressed by the stroller cover. I love a repurposed idea. Wonderful fabric for your stroller make over! I read down through your blog and love some of your other projects too! Your stroller make over is great. Fantastic idea. I never even dreamed of doing that. Thanks for sharing. Your quilts are just beautiful. But I really like the toy stroller cover. What a great idea! You did a wonderful job. Thank you for sharing. Great idea to give that stroller a makeover and it turned out so cute. Your other boy quilts are just gorgeous...thanks for sharing! I love the stroller re-do! What a great idea. I have a big boy, 31 yrs who would go crazy over the Cars quilt! LOL! They never grow up! How clever to make a girl stroller into a boy stroller. Your son is adorable too...love the curly hair (my son and I have curly hair too, lol). Your quilts a re beautiful too! I love the one quilted like wood grain. Wow. 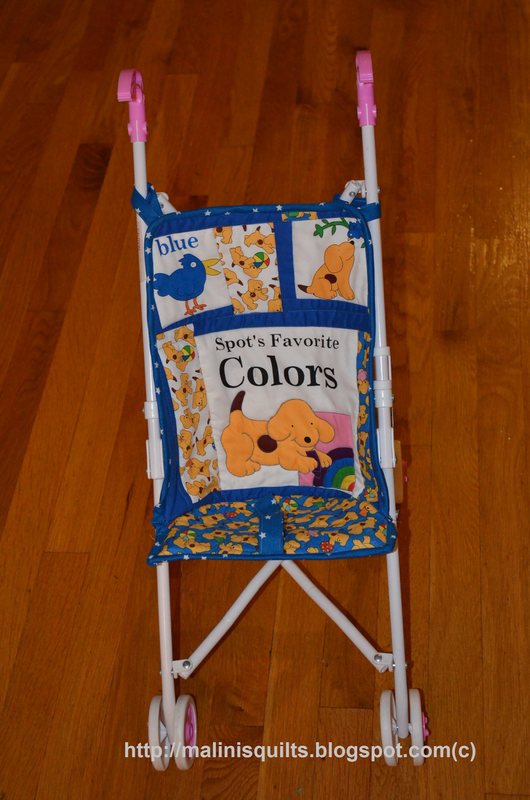 You are amazing for figuring out how to repurpose your stroller! It's super cute. I love how you recovered your stroller. Very creative! all great projects but the cars quilt is my fav! great job!!!! Beautiful quilts! Love the Modern one, the quilting in just lovely. My little guy was always taking over his siblings stuff too. Great redo for your son. Love the stroller makeover! Your quilts are really great....have never heard of the pattern, Blind Co-Pilot....a little scary! ;) Thanks for sharing with us. Great projects! I actually love Disney's movie Cars. Great job! Fabulous quilting on all of your projects! Great idea doing the carrige over. nice job. Your quilts are wonderful. The quilting is stellar. I LOVE your stroller cover. 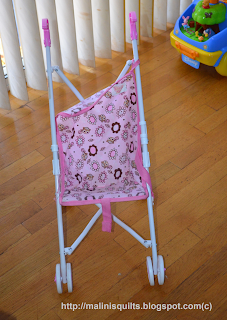 My girls are teenagers now, but I still have their doll stroller because it is in such good shape except for the fabric part. You have inspired me to try to make a new cover for ours. That is a wonderful new cover on that stroller! What a great idea. And your quilting on your previous projects is so beautiful! I absolutely love it. A BIG wow factor, I have to say. Thanks for sharing all your projects today. What a super idea to make over the stroller to suit your son. It turned out great and so did the quilts! What a great idea to cover the stroller for boys. I've known lots of little boys that love to push the stroller around. I never thought to recover it though, such a great idea!! Those doll strollers take so much abuse and keep on going...Love your seat cover - the pink definitely needed to be changed! Love the "Cars" quilt. You do such beautiful quilting! I love the toy stroller re-make, such a unique idea! Your model is a cutie. Yep, much better and your little guy looks thrilled with it. Well done on this and your other previously made boy quilts. What a great idea to re-cover a stroller. It is perfect for a little guy now! Thanks for sharing your creations and talent with us today. Great makeover on the stroller. Love the little Disney quilt too. Great work--the stroller looks terrific! 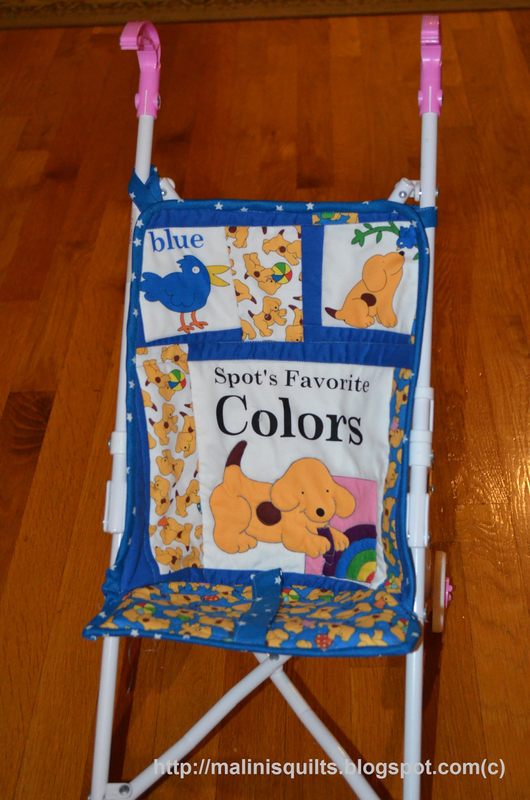 The Spot fabric is perfect for the stroller - your quilts are just stunning too! I love the stroller makeover!! And all your quilts look fantastic!! I haven't seen the Spot fabric before- I will be in the market! I love the stroller makeover! your quilting is fabulous!!!! That is a GREAT idea!!! and how in the world did you ever come up with how to do it??? Love all of your projects are just wonderful and so are the fabrics. I don't know anyone who doesn't like "Cars!" :) Great projects! You did a marvelous job on these! I enjoyed seeing your work. BEAUTIFUL modern (boys) quilts, a joy to watch! Lovely idea to make a new cover for the stroller. You son looks so happy, thanks for sharing! What gorgeous quilts! I love the little stroller too! Precious! Your talent knows no bound! Amazing stroller cover. I, for one, can't seem to sew anything to save my life. I can quilt, but sewing is quite a different story.